UK paper reveals Amnesty's director of faith and human rights, Yasmin Hussein, spent the night with a senior Muslim Brotherhood official. An expose by a British paper has revealed that a senior Amnesty international official has links with Hamas and a wider secret global Islamist network, once again raising questions about the NGO's alleged "impartiality." The report by The Times revealed that Amnesty's director of faith and human rights, Yasmin Hussein, is linked to a British "aid agency" which helps finance Hamas, and held a private meeting with a senior Muslim Brotherhood official at his house in Egypt. What's more, Hussein's husband Wael Musabbeh was named in documents released by the United Arab Emirates after a 2013 trial which saw 60 UAE citizens accused of conspiracy and sedition, over a plot to overthrow the government. While Musabbeh was not himself a defendant in that case, he and his wife were both directors of a Bradford-based charity "said by the authorities to be part of a complex financial and ideological network in which the UK and Ireland served as important hubs, linking the (Muslim) Brotherhood to its group in UAE," the paper said. Amnesty claims to have been unaware of the fact that Musabbeh is Hussein's husband, despite them being married for 20 years. But it did know about Yasmin Hussein's meeting in 2012 with a senior member of Egypt's Muslim Brotherhood government, Adly al-Qazzaz, described by The Times as "a ministerial education adviser who was blamed by a teachers’ union for instigating the 'Brotherhoodization' of Egypt’s education system." As part of her "unofficial meeting," Hussein joined al-Qazzaz for a family meal and even stayed the night at his home. Al-Qazzaz's son Khaled was the Brotherhood’s presidential secretary for foreign affairs, and the two of them were arrested after the ouster of the Islamist government in 2013. His daughter Mona was the Brotherhood's official UK spokeswoman. The meeting was a clear breach of Amnesty's own protocols, designed to ensure its status as an "independent and impartial" body, which require staff to declare any links which could constitute a possible conflict of interest. Colleagues who found out about the meeting alerted senior management, and Amnesty "examined and robustly interrogated concerns raised by colleagues," it said in a statement. However, apart from a slap on the wrist, the organization made do with a verbal commitment by Hussein not to do it again. She claimed she had no idea of the positions held by the al-Qazzaz family, and that her trip was a private one as part of her doctorate. She said she only wanted to meet with a government official "to encourage the synergies between human rights and educational planning." In response to the expose, Amnesty cited Hussein's denial at being a member of the Brotherhood, claiming that "any connections are purely circumstantial." 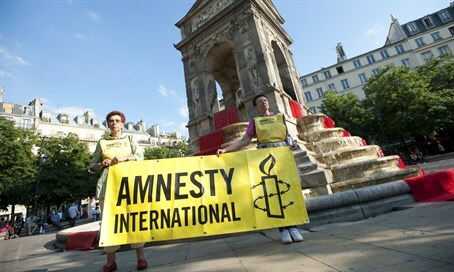 "Amnesty International does, however, take very seriously any allegations that would call into question our impartiality and is therefore investigating the issues raised," it added. The expose is just the latest report revealing Amnesty officials' support for Hamas and other Islamist groups. Earlier this month, the Israeli Embassy in London filed an official complaint with Amnesty, after a senior member of its UK staff retweeted Hamas propaganda, and blamed the Israeli government for a recent arson attack which killed two Palestinians.